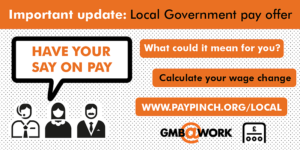 News from GMB Sandwell has been quiet over the past few weeks as our branch officials have been busy visiting as many workplaces as possible to give members a say over their pay. We have now concluded our visits but don’t worry, if you haven’t yet received a ballot paper they will be coming through the post in the next few days. If you haven’t received one by Wednesday 7th March please contact branch office on 0121 569 5990.